When the heat's on in the ring, there's nothing like a cool drink in the stands. 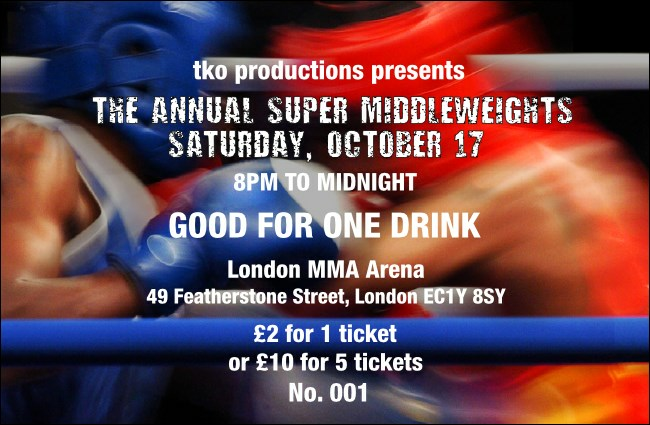 Boxing Drink Ticket, part of our matching Event Kit, expresses the bare, hard aesthetic of pugilism with a colourful image of 2 men squaring off inside the ropes. Use drink tickets to streamline the bartender's job, sell refreshments in advance, or reward your deserving boosters. Keep it clean with matching Event Kits to help you organize any event from UK Ticket Printing.